The bogus arrests of Occupy San Diego activists continue. Within the last 24 to 36 hours, a man was arrested for burning sage in the Plaza, a man videotaping another’s arrest was grabbed by the neck, choked, and brought down by three officers, a veteran carrying an American flag had the flag taken from him, two others awake in sleeping bags were roughly arrested. Freedom Plaza has now been “cleared” of those demonstrators. And we have Police Chief William Lansdowne to thank – as well as his boss, Mayor Jerry Sanders. Sanders is a lame duck and a burnt out politician. Lansdowne takes his orders from Sanders, but Lansdown could object to the ridiculous and unconstitutional manner his troops are ordered to harass and arrest peaceful demonstrators trying to exercise their First Amendment rights. There’s been a petition to demand the resignation of the Police Chief. Sign it here. 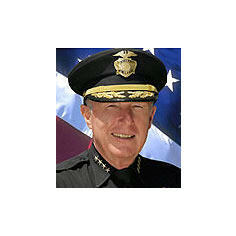 Chief Lansdowne has mishandled the Occupy San Diego Protest. He has facilitated the waste of over 2.4 million dollars in 30 days on suppressing free speech at Civic Center Plaza in San Diego. He has ordered the macing and beating of peaceful protesters and continues to waste over $57,000 per day on intimidating, harassing, and suppressing the peaceful protest rather than protecting and serving the interests of those exercising their freedom of speech and assembly. We the Citizens of San Diego call on Chief Lansdowne to resign his post as Chief of Police immediately. In response to these unconstitutional arrests and the continuing harassment of Occupy San Diegans, there is a call going out right now to hold a protest march. Others are gathering for a protest against the way our Freedom Plaza American flag was unconstitutionally seized by police. Occupy Veterans and Active Military (off duty) – and everyone else – are assembling TODAY at 4pm (or 1600 hours in mil-speak), at 4th Av. & B Street in downtown San Diego to RECLAIM the U.S. Flag for Peaceful Assembly, after the Occupy SD U.S. Flag was confiscated from Iraq Veteran John Canter last night, and he was citedfor violating SD Muni Code 53.30. This U.S. Flag has been flying proudly in Freedom Plaza at Occupy San Diego for over two months. We are calling on EVERYONE who can to join this peaceful assembly to RECLAIM the U.S. Flag flying proudly on its flagpole. BRING U.S. FLAGS, and if you have a flagpole and okay w/ being cited for misdemeanor (see following explanation), that’s preferable. Otherwise, bring the U.S. Flag in whatever peaceful, respectful form you wish. Bring American flags. And other banners, flags, indicia of protest. See these videos of unconstitutional behavior by San Diego Police officers. Videos at Daily Kos of sage burning arrest and other bogus arrests. Apparently, the cops took everything last night. They/ we need snuggies, United States Flags, chalk, markers , cardboard for signs, made signs, prepared food, bottled water, hot coffee and a word of encouragement. It’s time to organize a larger, inclusive action including people who might not be checking their email every 8hrs– but also include an element of surprise by focusing on face-to-face, word of mouth planning. As I look back over my photos from that first weekend in October I can’t believe what Occupy has been reduced to here in SD– but we’re no longer able to bring out kids out–the marches are quick and rushed–and there is still this aggressive tone that I can stand on my own, but prefer not to subject my family to. So, the City / Mayor forced us into confrontations with the police, and made our First Amendment rights the issue. It appears that in order to criticize Wall Street and the big banks, we first have to fight for our rights to demonstrate and show dissent at all. And this regretfully is why supporters as yourself don’t want to bring families down to Freedom Plaza. Although, at times, like the Vets’ march yesterday (12/22/11) there was hardly a cop in sight. But as soon as the marchers took off for the Federal Building around 5:30, whoosh, cops come into the Plaza and hassle some people about a backpack that they had set on the ground. I have been filing complaints for the past 5 years with the police at the Earth Day Gathering in Balboa Park, siting SD Muni Code 53.30 against the huge signs of unborn fetuses carried around by the fundie-mentalist anti-choice movement. These large signs are posted on PVC pipe in a cross and stand 6′ – 10′ tall. I don’t care what the signs say, my complaint is that they are a safety hazzard being so big that any little gust of wind can cause the carrier to possibly drop it and hit or hurt a passerby. I’ve also mentioned to police on patrol in the park that the poles the signs are attached to are possible weapons. I’ve suggested the police ask the sign carriers to remove the PVC pipes and just carry the signs. The regular answers I’ve gotten is that nothing has happened, the police can not be responsible – go file a complaint with the Earth Day producers, this is not a protest so the police can’t do anything and ‘we’ can’t do anything until something happens. It is not OK for the San Diego police to pick and choose which laws and city codes they will and will not enforce!!! Unlike the fundie-mentalist anti-choice movement and their Birth Control clinic bombings, hate crimes, harassment of pro-choice supporters and the murder of clinic doctors; the Occupy Movement is dedicated to Nonviolent, Peaceful protest. Occupy members deserve at least the same respect and justice as the anti-choice movement!!! Hey just submitted story with photos from tonight Frank. Hey, I had plenty to select from… the place was pretty full of flags. Yup, I staid later than I should… but I got some dinner for some of our homeless occupiers. Newer Article: ‘Tis the season to be jolly’ … riots, pepper-spray, chaos, marijuana smoking … at Air Jordan shoe sales.